A barrier to sleep, or when used to mask annoying sounds, a veil making it possible. It frequently induces the psychological phenomenon known as pareidolia, leading one to hear voices. Listen as needed to mask noise preventing sleep or interfering with studying. Adjust volume as appropriate. 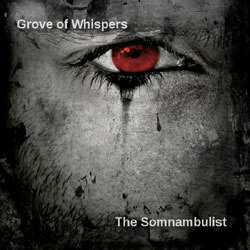 Grove of Whispers is John Tocher. Cover adapted from a photo by BitJuice. Recommended to play as you prepare to sleep, or even as you sleep. This entry was posted in Catalog and tagged Bing Satellites, C.P. McDill, Catalog, Dark Ambient, Disturbed Earth, Experimental, Grove of Whispers, John Tocher, noise, Pixyblink, Releases, The Implicit Order by C.P. McDill. Bookmark the permalink.